When I won this book in a draw at the Richmond 2013 Junior Authors Writers Conference, I had no idea what I was in for, but I certainly couldn’t have fathomed how relatable the story would be to my life. 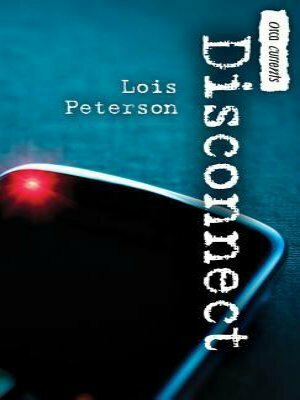 Enter Disconnect by Lois Peterson. Our teenage protagonist, Daria, has recently moved to Delta, BC from Calgary, Alberta and is trying very hard to stay connected to her old life. Practically everywhere she goes, Daria is texting her old friends, wanting nothing to do with life around her. I like the line, “School–and life–are hard enough. The only way to survive is to stay connected.” It surmises how dependent many of us have come to needing mobile devices. The problem facing Daria is that she is hanging between two worlds without knowing it. Her desire to stay in contact with her friends in Calgary distances herself from the people in her life. Usually, this results with them getting annoyed at her and her at them. These scenes add a bit of ironic humour to the story as the reader can clearly see that she has a problem with her phone, but Daria keeps denying it. She doesn’t want to make any new friends; she wants to hold onto as much of her old life as possible. The secondary protagonist, Cleo, is from the opposite end of the spectrum. She’s new in town too, but unlike Daria, she doesn’t rely so much on mobile tech. And, for that matter, she doesn’t even own a cellphone. Cleo represents that part in all of us that knows how to enjoy life at its simplest, without the need to be locked up on the internet. This side of us is often pushed away by our tech desires, just like Daria tries to push Cleo away when she tries to help and be a friend. When Daria ends up putting a life in danger, things take a very interesting turn. It’s at this point where the chips are down, and things have to change. Like any person with an addiction, she downplays that her texting habits are the problem. This kind of scenario towards recovery is very realistic. Habits like these take time to get over, and it is emotionally gripping to see Daria walk this path as she tries to become a better person and make up for what she has done. This kind of journey is no easy task; it never is. She has her family and Cleo giving support along the way, and it is really something to see the kind of character she becomes in the end. But perhaps the greatest thing about this book is that it’s a good read for anyone. Even if you’ve never owned a mobile device, this story is still relatable because it offers a glimpse into how changed our world has become. It appeals to your desire for connection through Daria and appeals to your desire to enjoy the simple parts of life through Cleo. Any teenager with a mobile device has probably heard from their parents, “Put down the device and go outside.” It’s no secret that the youth of the 21st century live in a fast-paced world where technology has become a staple in everyday life. Of course, that does open us up to be susceptible to the pull of the digital world. The desire to connect with people halfway around the world wasn’t so commonplace twenty years ago as it is today. And since we now have the ability to do so, how easy is it to draw away from reality and the people in our everyday lives?